RenewalWorks is a catalyst for refocusing parishes (and the individuals in them) on spiritual vitality. It has been tailored to the Episcopal tradition, adapting 10 years of research that has uncovered key characteristics of flourishing congregations. It will inspire your congregation and leadership to rediscover who Jesus is, and what it means to follow him. 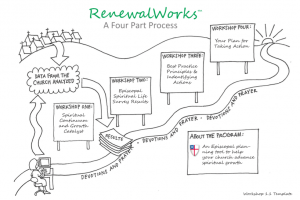 Through a guided methodology of self-reflection, sharing and workshop discussion, RenewalWorks challenges parishes to refocus on spiritual growth and to identify ways that God is calling them to grow. Several of our diocesan congregations have used this survey and the follow-up materials to help them deepen the spiritual lives of their members. You can learn more about the program that their website: RenewalWorks. You can learn more by watching a video interview with the Presiding Bishop and the Reverend Jay Sidebotham (RenewalWorks Director) from The Episcopal Diocese of NC on Vimeo. Curious about how the RenewalWorks process works? Here’s a quick look at it from beginning to end (which is also a beginning). The Spiritual Life Inventory and a personalized report, based on your congregation’s data and benchmarked against more than 1,800 churches of all denominations that have also taken the survey over the past decade. Three copies of Footsteps by Jay Sidebotham, which explains the importance of spiritual growth and the methodology behind RenewalWorks. Discounted copies are also available for your workshop team and congregation. Often parishes within a diocese participate in the process together. In those instances, the churches complete the Spiritual Life Inventory at the same time and share best practices, preparation, and training, etc. Please contact us directly if you are interested in sharing this idea with your diocese. We’re glad to help. Step 3 Complete the church profile to give us more information about your congregation, and select a date for launching the Spiritual Life Inventory. The Inventory and workshop dates go on your church’s calendar and you begin telling the congregation about the program and how their participation and prayers can help. Prepare a promotional plan 4-6 weeks prior to the SLI launch to ensure enough time to get the word out. Step 4 Select a workshop facilitator and a team consisting of nine to twenty-four parishioners, depending on the size of your church. The team includes your clergy leader and should represent a cross section of your community. Team members should be willing to commit to the four workshop sessions and the homework assigned to help them prepare. Step 5 Spiritual Life Inventory Launch: The congregation completes an anonymous, online Spiritual Life Inventory, which is available for three weeks. The survey is designed to learn where people are in their spiritual journeys and how their churches help in that journey and where they might do better. Workshop 1: Where have we been? The main topic for discussion is spiritual growth. Workshop exercises help team members reflect on the dynamic nature of their own faith and the role played by their church and clergy in supporting and encouraging spiritual growth. Workshop 2: Where are we now? The team looks at the Inventory data from their congregation, along with basic information on demographics and growth for their church and area. This session builds a picture of where the church is now that can be used in the last two sessions as they consider new ways to help their church grow in love of God and neighbor. Workshop 3: Where do we feel called to go? Using RenewalWorks research and your congregation’s data, this session focuses on how your church can encourage and support spiritual growth. The team explores five best practice principles found spiritually vital churches and considers how those principles can be applied in the congregation. Workshop 4: How will we get there? After reviewing what they’ve learned, the team develops a few concrete next steps for refocusing on spiritual growth to present to the vestry and congregation. Team members consider their individual commitments to spiritual growth, and close the series with thanksgiving to God for this time and work together and with hope for its impact on the future. Step 7 The Workshop Team shares what it has learned with the vestry and congregation. Step 8 Spiritual growth emerges as the priority in your congregation, bringing new energy to every aspect of your life together and your mission in the world. * The Congregational Development Commission has funded or assisted congregations with the cost of RenewalWorks. To apply for a grant go to Apply for Money in the Rescource Library.